It’s said that a large percentage of the American population has never seen the Milky Way – especially young people. It’s just too bright at night in the urban/suburban areas where they live. Of all the generations of mankind that have ever lived, this is a recent, and somewhat sad, phenonmenon. In the photo above (which I wish I could say I took), Jupiter shines brightly below the arc of the galaxy disk. This is a time elapse photograph, so the Milky Way won’t look as bright to the naked eye; but it still will impress. 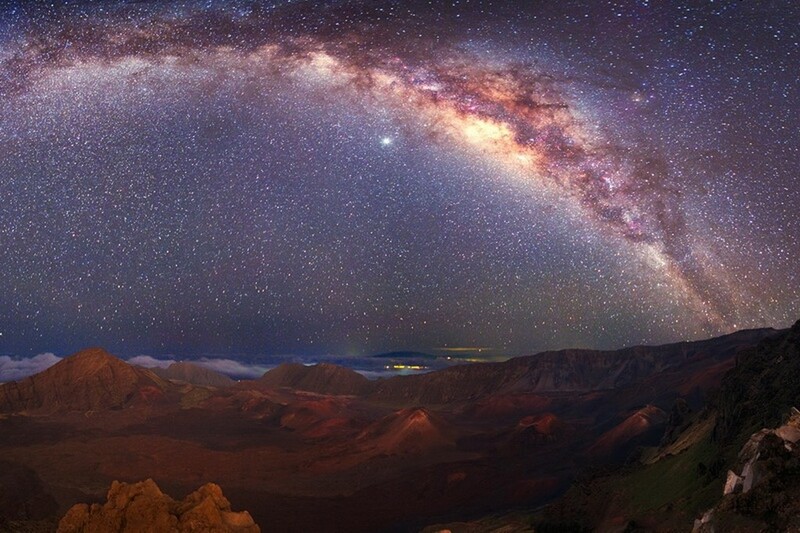 The best (and coldest) views of the stars on Maui are from the top of Mount Haleakala. There are serious research telescopes on top of the mountian – not like the world-class telescopes of Mauna Kea on the Big Island, but impressive nontheless. You can’t look through the big scopes, but you can look with your naked eye or, if you have them, binoculars or a small telescope. Even small binoculars will reveal a wonder of stars and (if you know where to look or are just plain lucky) other wonders of the night sky. Even people with very ordinary night vision can see the Andromeda Galaxy with their naked eye, 2.5 million light years away! With binoculars, other galaxies, ghostly nebula, the moons of Jupiter, and brilliant star clusters await those with patience and a little knowledge or luck. If you’re out on a clear dark night on Maui, stop somewhere dark and look up. You won’t be disappointed. See our other posts on Haleakala titled Haleakala – The House of the Sun, Haleakala – Come Prepared, and Haleakala – Into the Crater. There are several great trails into the Haleakala erosion crater. If you click on the picture to the right you can see a line of horses and riders ascending the Sliding Sands Trail. It’s only when you see something like this that you get an idea of the scale of the place. While this is all explained in the Maui trail book in our condo, the trail head is a short walk around the cinder cone on the south side of the parking lot. From the start of the trail it’s 2,500 vertical feet to the crater floor – so the hike down is pretty easy. The hike up is another matter. Depending on your physical condition and how you react to the thinner mountain air, it will take 1.5 to 2.0 times as long to hike out as it takes to hike in. Keep this in mind if you’re hiking later in the day. It gets dark (and cold) fast when the sun goes down. Even in summer it can be chilly in the shadow of the west rim of the crater in the late afternoon. As you can see from the photos, you are entirely exposed on this trail. Use sunscreen and carry water. We generally hike with a daypack with water, snacks, extra clothing and anything else we might need. 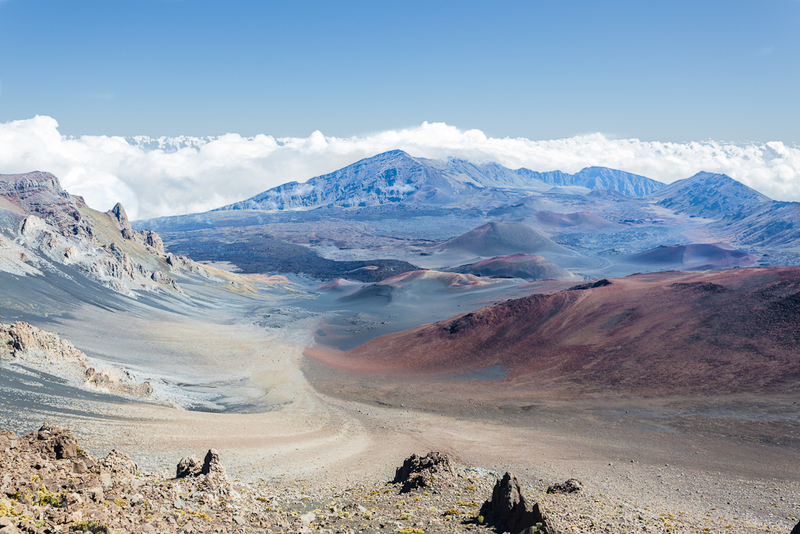 Consider adding a hike to your Haleakala experience. If you come early for the sunrise, you can hike in and out before lunch and then enjoy a meal in the Up Country. Alternatively, if you’re not into starting your day at 2 or 3 AM so you can see the sunrise, you can hike in the afternoon and time your return to see the sunset from the top of the mountain. It’s a whole lot like the sunrise, but without the busloads of tourists and people standing five deep at the best vantage points. Speaking of sunrise and sunset, did you know that Haleakala means “house of the sun” in Hawaiian? To find out more, click here. For another great (but harder) hike into the crater, click here to see our blog on the Halemauu Trail. There’s lots to do on Mount Haleakala: hiking, biking, horseback riding, star gazing, watching the sunrise (or sunset), camping, birding, or just escaping the heat of the beach for a day. While you’re there or on the way, you have a good chance of seeing rare plants and rare birds and, at the top, a landscape not unlike the pictures from Mars. There is also a chance you’ll see nothing. If the mountain is shrouded in clouds, wait for another day. If you can see the top from outside our front door at Maui Vista, it’s worth a try. Even so, the weather on Haleakala can change rapidly and the erosion crater can fill with clouds in minutes. On the other hand, it can change for the better just as fast. If you go, be prepared. According to the National Park Service, the average temperature at the summit is 17 degrees (Fahrenheit) cooler than at sea level. And that’s an average. It can be very cold especially at night and in the shadows. If the wind is blowing and you don’t have layers of clothing, you will not stay long. In addition to the drop of temperature, several other things happen at 10,000 feet. First, many people feel light-headed due to the thinner atmosphere. Take it easy until you know how the altitude affects you. The thinner atmoshpere also means the UV rays are even stronger than at sea level. Fortunately you’ll probably be wearing more clothes than your normal beach wear, but remember to bring sunscreen. Finally, if you’re active, you may need more water than usual. There’s precious little water and no food at the summit. If you plan to stay a while, bring your own. It’s about a two hour drive from Maui Vista to the top of Haleakala over good, but windy roads. It’s a National Park so, if you don’t already have a pass, there is a $10 entrance fee per vehicle. The pass is good for three days and includes the driver and all passengers. There are also things to do and places to eat in the Up Country below the park. (See our posts Kula – a Drive in the (Up) Country and Grandma’s Coffee House in Kula.) Make a day of it! 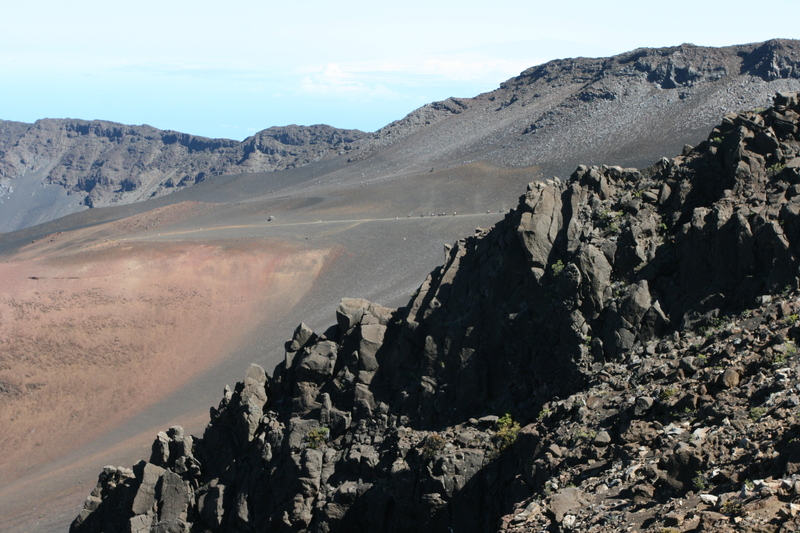 See our other posts on Mount Haleakala by clicking here and here. The photo to the right is of a print by Dietrich Varez which hangs on the living room wall of our Maui Vista 2418 condo. It depicts the story of Maui slowing the sun. Legend has it that Hina, the mother of the demi-god Maui, made kapa cloth from the bark of local trees. But when she dyed the cloth in the morning the kapa would still be damp in the evening. “The sun moves too quickly across the sky,” she cried. In those days, from their Big Island home near Rainbow Falls not far from modern day Hilo, it was clear that the sun rested at night in the crater of Mount Haleakala for part of the year. So, upon hearing his mother’s lament, Maui took his canoe and traveled across the water and, while the sun was resting, climbed the 10,000 foot mountain and looked down on the sleeping sun. As the sun stretched to begin its day, Maui lassoed it with a rope of twisted coconut fiber and held on tight. Maui demanded the sun move more slowly so his mother could dry her kapa cloth. Bargaining with Maui, the sun promised to slow its journey for half the year and move at its accustomed pace the other half. Maui released the sun and returned to tell his mother the good news. Delighted, she made a new cape for her son and, thanks to the sun’s slower pace, it dried that very afternoon. Ever since, the warm days of Hawaiian summers have lingered several hours longer than the days we call winter in colder climates.